After two years of more than average rainfall, members of the Bourne Society in the know are looking keenly for signs of a flow near the Woldingham viaduct. 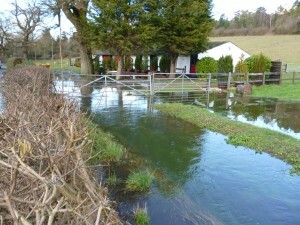 There is water to be seen in the only place in Kenley where the Bourne is not restrained by a culvert, but as yet – in July 2000 – the ploughed field near Cotters Hill Farm is dry. The flow from Coulsdon has been seen far less often than the Caterham flow. In recent years when the waters rise, the road beneath Woldingham viaduct floods, the dip alongside the Woldingham Road fills, the stables there flood completely, parts of the Wapses Lodge roundabout are inaccessible and water floods its way relentlessly through office blocks and school grounds on its way northwards to Croydon and to the Thames. It can spread wide without causing disruption in Bourne Park, before it floods the allotments off Bourne View and is last seen by the cricket ground at Kenley. One member reports that it used to be a challenge for both girls and boys to walk through the tunnel that connects the sports field at Kenley with the old waterworks at Purley, socks in pockets and shoes carried tied together. The tunnel has several slight bends, so that it was in frightening darkness most of the time. On the last occasion – in 1995 – there was flood water higher up the Halliloo Valley in the bunkers and hollows of the new Dukes Dene Golf Course, which was pushing up behind the water-retaining features the club had laid to hold back some of the rainfall and reduce its need for irrigation. Despite a careful study there is no sign ecologically of a waterside habitat. In times long gone there would almost certainly have been wetland plants along the Bourne’s course, but presumably nowadays the ground does not remain damp for long enough to sustain such plants. From its source to Bourne Park there was no sign of plants growing more luxuriantly because they have access to more water. In the park, the channel was marked by vigorous plants of Jack by the Hedge or Garlic Mustard ( Alliariapetiolata ), which is not known as a wetland species but is a native of rough ground and hedgerows. The Sutton & East Surrey Water Company has kept a log of the Bourne flows starting in 1903, with flow measurements taken at its Treatment Works at Godstone Road Kenley, the Purley Works and Smitham borehole site, Coulsdon. The rates of flow were recorded either daily or even twice daily to begin with. The company has kindly provided the schedule of periods of flow since 6 December 1903 and also a chart showing the variation in the borehole levels at The Rose and Crown since 1969.